Cucumbers are botanically classified as a fruit, although they are typically perceived, prepared and eaten as though they were a vegetable. Cucumbers grow from a low-lying flowering plant and are actually considered to be a part of the squash family. 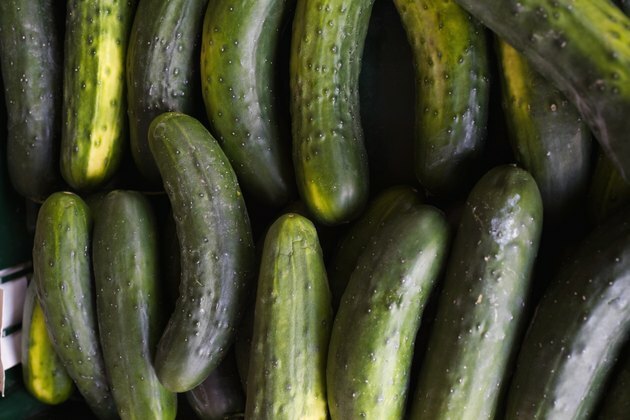 Although cucumbers are made up of roughly 90 percent water, they also contain a high amount of beneficial nutrients that promote the health and maintenance of many cells in your body. Nutrients found in cucumbers in large amounts include vitamin A, vitamin C, folic acid and silica. Vitamin A is important for the health and maintenance of your skin, keeping cell membranes moist and resistant to cellular damage. This moistness also inhibits potential infections caused by some viruses and bacteria. Vitamin A also protects your body against some cancers by inhibiting the production of DNA in cancer cells. Most of the vitamin A in cucumbers is contained in the outer peel; therefore, to obtain the full benefits of vitamin A, the cucumber peel should be left on. Vitamin C, also called ascorbic acid, is an effective antioxidant and can be found in abundance in cucumbers. Vitamin C helps support and strengthen your immune system, which can help protect your body against infections and bacteria that can cause illnesses. Vitamin C can also promote wound healing and is involved in the maintenance of bone, muscle, tendons and ligaments throughout your body. Vitamin C supports your cardiovascular system by facilitating the metabolism of body fat and protecting your body from damage caused by free radicals, compounds that are destructive to your body. Folic acid is part of the B-complex vitamin group and is important in the production of red blood cells in your body. Low levels of folic acid may contribute to certain types of anemia, or low red blood cell count. Having a low red blood cell count decreases oxygen delivery to your body's cells and can even make other underlying medical conditions worse. Anemia can also cause fatigue, weakness, chest pains and dizziness. Having adequate amounts of folic acid in your diet can help prevent anemia from occurring. Cucumbers are a good source of a compound called silica. Silica is a trace mineral that is not common in many foods, but is found in high levels inside cucumbers. Silica contributes to the growth and maintenance of connective tissue throughout your body. Connective tissue includes collagen and elastin, two body tissues that are responsible for connecting your cells together and holding them in place. Connective tissues also play a large role in the natural healing process of your body following an injury involving soft tissue damage. Collagen formation around an area of an injury may be increased with the help of silica in your diet.